Regardless of what you may have been told or what you may believe, investing in the stock market is still one of the most effective ways for most people to build wealth and best of all, a high IQ isn’t needed to do so. You simply need to know how to invest the right way since most people invest the wrong way. 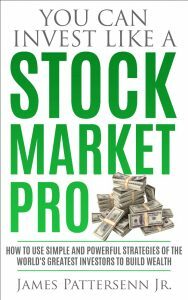 You Can Invest Like a Stock Market Pro reveals to you the tried-and-true, principles and strategies used by some of the world’s best and most successful stock market pros to build wealth.